The Garden spans a valley between dolerite koppies (small hills) capped with rocky outcrops typical of the area. 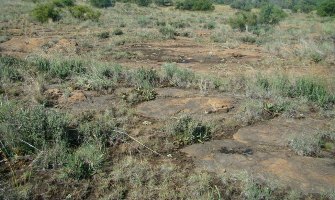 This natural vegetation comprises grassland, woodland and fascinating Karoo plants. Succulents and bulbous plants form a natural garden amongst the rocks on the koppies. In this area grasses are restricted to depressions and crevices filled with fine soils. Remarkable is the presence of abundant geophytes (bulbs). Solitary shrubs and small shrub groups include Diospyros austro-africana, Euclea crispa subsp.ovata and Searsia ciliata. You will also find plants such as Stomatium spp, Albuca spp, Ruschia spinosa and Strumaria tenella subsp. orientalis. This part of the Garden remains pristine and naturally conserved. – Visit SANBI’s plant information website for more on plants in our Garden.